It takes approximately 1 hour by taxi or car. 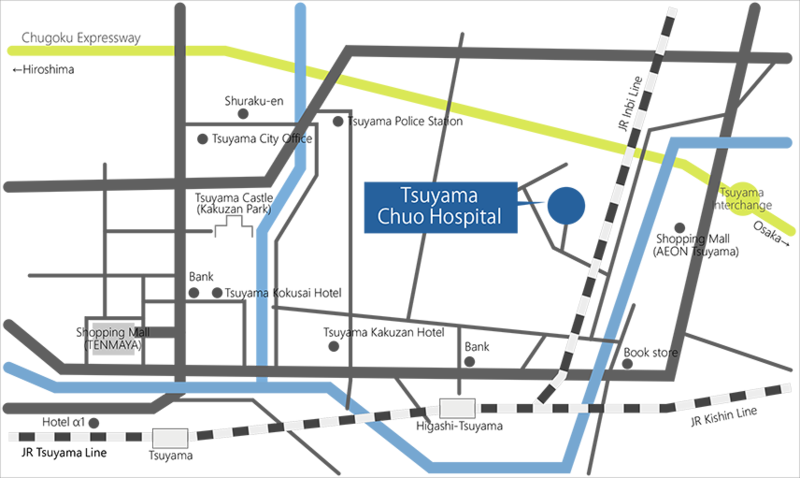 Check the map below for detailed directions from Okayama Station. It takes approx. 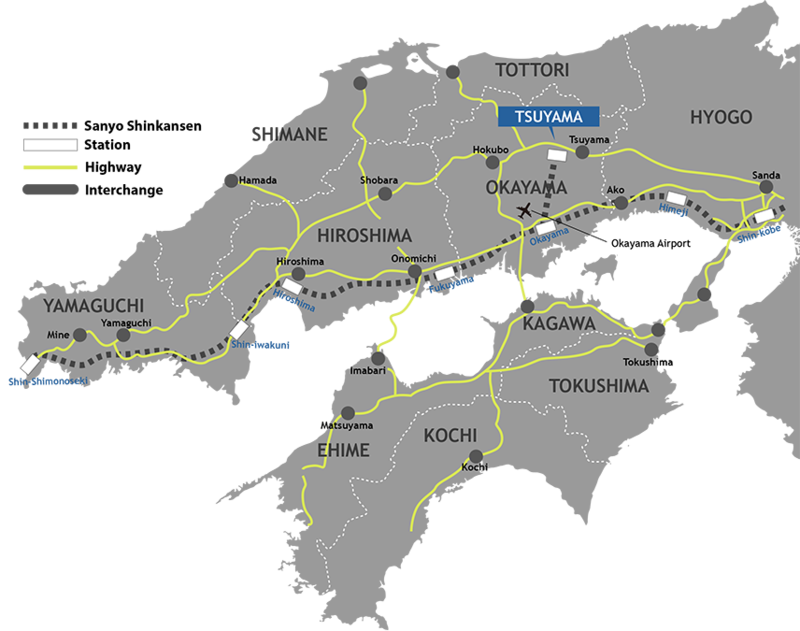 1 hour 40 min by taxi or car via the Yonago Expressway. From Yonago Airport, board a Sakai Line train and head to Yonago Station. From Yonago Station, board a Hakubi Line train and head to Niimi Station. From Niimi Station, board a Kishin Line train and head to Tsuyama Station. 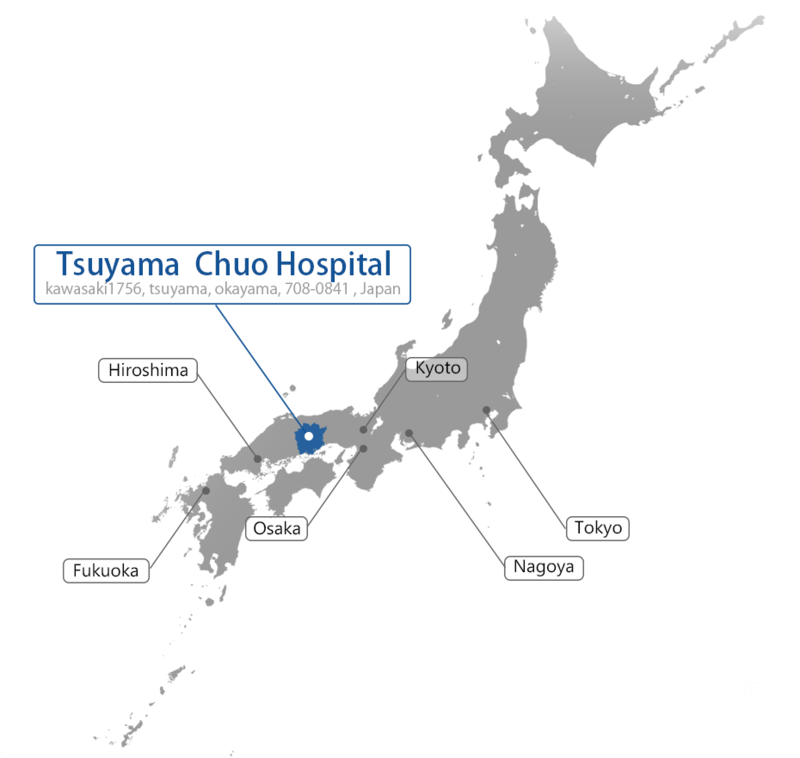 Get off at Tsuyama Station, and take a taxi or Gongo Bus (city loop bus) to the hospital. Board a JR Tsuyama Line train bound for Tsuyama. Board the Okayama Express Tsuyama (Chutetsu Bus) at Okayama Station. It takes approximately 1 hour 40 min by taxi or car. You can take a bus, taxi, or train from Kansai International Airport to Osaka station. Board a highway bus bound for Tsuyama at Osaka Station. Get off at the Tsuyama Interchange bus stop. It takes approx. 10 min by taxi to the Tsuyama Chuo Hospital from the bus stop. It takes approximately 2 hour 40 min by taxi or car.